Arachnophobic? Terrified by webs and creepy-crawlies? Garden sheds don’t have to be no-go areas – tackle that phobia! I have been terrified of spiders for as long as I can remember, and this autumn in particular is the worst time for people like me. If you hadn’t already noticed, spiders are everywhere – silvery webs fill back gardens, spun across branches, bushes and fences, all with larger-than-average spiders at their centre. Apparently, the warm summer means that there’s more prey for them to fatten up on – so even if their numbers haven’t swelled, their bodies have. I would describe my level of fear, at any time of year, as phobic. I know that phobias are usually learned, or acquired through a traumatic experience, and they’re more common in worriers like me. My spider fear rises and falls according to how stressed I am, as though I’m projecting my woes. I hate everything about them: webs, legs, suspended bodies, the scuttling, the prolonged stillness, their silence. My least favourites are the thick, dark spiders that hang out in baths. After a fraught move to the countryside in the spring, a spider encounter rocketed my phobia to untenable levels: I got out of the bath, only to be trapped by a modest-sized creature on the floor between myself and the closed door. I stood on the toilet seat, skin crawling, and shouted for help. Nobody heard. It was me against this minute, harmless creature, so I threw some towels over it and ran for my life. Ever since then I’ve been on red alert: something brushes my arm, and I go into fight or flight mode. I worry about the effects my anxiety will have on my two small children. So I decide there’s only one way forward: tackling my phobia. I book a place the Friendly Spider programme at London zoo, but I’m really nervous. There will be spiders. The course, which is hosted by John Clifford, a hypnotherapist, and Dave Clarke of the invertebrate conservation unit, is split into four parts over a Saturday afternoon. John is charming and calming, and begins by congratulating everyone for having the guts to face our fears, and assuring us that we’re not alone – 8%-10% of the population are arachnophobic. Once the fear is embedded in your unconscious, he says, no matter how much rationale you chuck at it, when confronted with a spider you’ll react as though your life is in danger. He tells us that coming along today is the biggest step towards overcoming our phobias. Dave kicks things off by setting a few facts straight, putting the “threat” of British spiders into perspective. He assures us that spiders can sense warm-blooded animals and will avoid them if they can. Houses, it turns out, aren’t great environments for spiders either – they’re too dry and there aren’t enough bugs to eat, so we should put them out for their own good. We break for tea and custard creams, before moving on to the next stage: group hypnosis. We are made to feel deeply relaxed while our unconscious minds are told that spiders are safe, and then we visualise a little fluffy white cloud turning big and black as we fill it up with our negative feelings about spiders. Then Dave tells us we are ready for the main event – a visit to the bug exhibits. The zoo has collected some house spiders for us. There’s a whopper that, in order to get our certificates, we must catch with an upturned pot and a piece of card, lift off the table, and place down again. I am as horrified as ever by the sight of this spider, which makes me want to cry. But going home without a certificate would be depressing, and after cheering on others at the catching table, I am satisfied that this spider doesn’t run that fast, and there’s little technical skill involved in the task. So I do it. Twice. Finally comes the opportunity to hold Agatha the tarantula. I’m surprised to discover I’m not that scared of her. Sure, she has large fangs tucked into her soft underside, but she’s docile and exotic. Could my unconscious mindset really have changed so quickly? Something certainly shifted: perhaps it was a combination of Dave’s reassurance, the hypnosis and seeing my fellow phobics so bravely facing their fears that eventually had an effect. Back home, I find I have become oddly fascinated by spiders. I begin to feel empowered, knowing how easy they are to catch. A month on, I have grown increasingly relaxed about them. The shed is no longer off limits, and the other day I happily coexisted in the house with a whopper (we’re talking a 12cm leg span). While I didn’t want to touch it, I was calm, with no physical symptoms of fear. I didn’t love it, but I respected it. 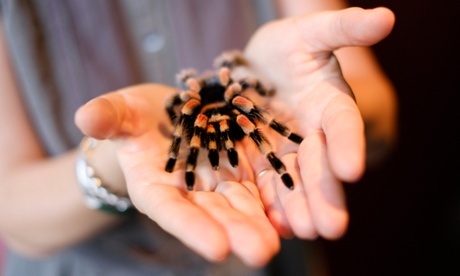 The Friendly Spider programme at London zoo is £135 (£94.50 for concessions). 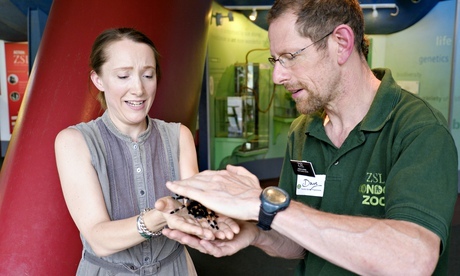 Bristol zoo also runs a Living With Spiders course for £95. Contact: Linda Alexander 0141 632 1440 and 07875 493 358, also linda.alexander@talktalk.net for help with spider phobia.